As you may have heard, Hope Pregnancy Ministries was recently recognized for our innovative work by WORLD Magazine, a leader in national and international news. WORLD Magazine is a bi-weekly Christian news publication featuring U.S. and international news, cultural analysis, editorials and commentary, as well as book, music and movie reviews. 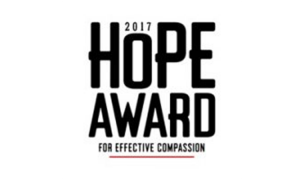 Earlier this year, Hope Pregnancy Ministries was nominated for WORLD Magazine’s prestigious 2017 Hope Award for Effective Compassion, and in April was chosen as the Northwest Region Winner for this award! Hope is unique among pregnancy care centers in the distinct ways our ministry has grown to include: partnering in education with Kalispell Regional Healthcare’s Neonatal Intensive Care Unit; providing STI Training for pregnancy medical clinics across the nation; serving as a clinical site for MSU Nursing Students; and achieving national accreditation for our medical clinic. This nomination from WORLD has placed us among four other outstanding non-profit organizations nationally and internationally, and we are more than honored to be counted among such accomplished groups. A reporter from WORLD spent some time with us in April, delving into the ministry of Hope. In mid-June, our story appeared in the online edition of the magazine, and will be published in the July 1 print issue of WORLD! We at Hope are so humbled by this nomination, and are praying that the mission being carried out here in Kalispell will reflect positively on Pregnancy Medical Clinics all across the nation. There is a significant cash award to the winner, and winning would be a blessing! But more importantly, we are privileged to be considered for an award that identifies effective compassion. To me, there is no greater honor. As a supporter of Hope, you’ve helped this happen. Thank you! I’d love for you to check out WORLD Magazine, and give yourself an opportunity to vote! Visit them online at https://world.wng.org/ to read the article and cast your vote for Hope! On their home page, you’ll see a link (on the black banner) labeled, “Hope Awards Voting”. Simply follow the link; scroll to the bottom of the page and click on the link for a very simple online voting form. We would so appreciate your show of support as you vote for Hope Pregnancy Ministries. We’re so thrilled to share the ministry of Hope with the WORLD, and pray that our story will serve as an inspiration to other pregnancy medical clinics across the country. To God be ALL the glory.